Ok, last one…..promise. Well, I do have a tree-full in the garden so they might just reappear at some time. Hoping to get out into the hills this weekend and do a spot of sketching if possible. The sun has returned briefly but tomorrow rain is forecast so nothing doing there. Hey ho. Oh, those oranges keep coming. I’m getting a bit sick of them now, hope you’re not feeling the same way. The oranges are still going and featuring a lot this week. It was a lovely sunny day today but I was hard at it at the easel so didn’t see much of it. 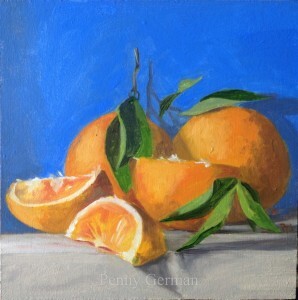 I’ve been working on a larger painting of oranges which I’ll show you when finished. Oranges are in plentiful supply here and are delicious. Before they go in the juicer, there will be a few painting s this week. The winner of the prize draw last week, to celebrate my having completed five years of daily painting is………….drum roll – Lucy Yarrow. Could you please email me with your address Lucy and congratulations. This old, French coffee tin was a junk-shop find. I have to restrain myself from going in them these days as my props cupboard won’t take much more. I’ve just been to the vegetable/fruit shop and loaded up with pomegranates. I have a fancy to do some large paintings with them so bear with me. I’ve also discovered the joys of pomegrante on Weetabix. A bit of a delicacy and not sure Yotam Ottolenghi would approve. Have a lovely weekend. Some roses that I’d painted for someone…….they lasted an extra day so I made the most of them. There are things poking through in the flower-beds here and I’ve spotted some sweetpea shoots growing up the fencing on the tennis courts……shouldn’t be long now. In the meantime, it’ll be oranges and pomegranates next week as they are in abundance! Just time to blog before I nip off and practise my Gay Gordons…….Burn’s night looms. 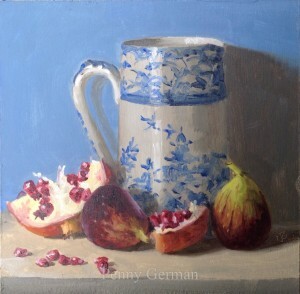 I did this one before I left the UK and can’t believe I paid over £1 for a pomegranate! They’re about 10p each here. Guess what I’ll be painting next week? Wow, thank you for all your kind comments on my celebration of five-years daily painting. All your names are in the hat for the prize draw along with those who have “liked” my FB page. Here’s to another five!……heck. Ok, I’m back in the saddle and I have some big news! Drum roll………..I’ve passed my five-year milestone. Yes, five years of daily painting and I’m still loving it. It has to be said, life has thrown a few things in the way of production a few times last year and all the travelling means a few gaps in blog but essentially I’m producing five-six daily paintings a week and enjoying every minute. I’m also producing some larger pieces so life is pretty busy. 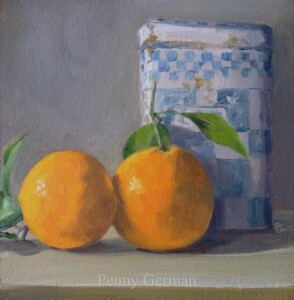 Anyway, I will be giving away a painting (similar to this one, painted from same still life) to celebrate in the next week so let me know if you’d like to be in with a chance by replying to this blog or liking my FB page https://www.facebook.com/Penny-German-Art-1440674559559048/.